I remember so well the morning our medical examiner came into my office to tell me about the autopsy. He had just completed his post-mortem examination on a woman I had seen the previous day. She was a long-time patient of mine; I knew her well. She had come to me for “just another migraine”—her usual problem. Less than 24 hours later, she had died from bleeding into her brain. This was among the most terrible events in my life, causing memories of that event to be very deeply etched. Even after 25 years, I can still describe her in fine detail, down to the dress she was wearing and her hairdo. No other patient remains so clear to me. Stories like this aren’t rare. As a physician who studies patient safety and medical events gone wrong, I hear from strangers all over the world who share these deeply personal experiences with me. While the emergency department, operating rooms, and intensive care units probably face death the most, if my inbox is any indication, clinicians in all medical specialties have dark and painful encounters. The effects can linger for decades, lurking in the background of even successful and prestigious careers. I’m an anesthesiologist, so I care for patients during some of the most high-stakes moments of their lives—birth, surgery, critical illness. I’ve seen injuries and diseases so severe that the best efforts of the best experts, even when perfectly executed, cannot fix them. I’ve also seen the most capable and caring healthcare professionals make mistakes—and I’m sure I’ve made my share. Witnessing death is hard on most people, but there is a perception that physicians are supposed to be immune. The psychological aftermath of painful cases is rarely discussed among doctors—at least, not publically. And that is putting both doctors and patients at risk. More than likely, the death of the woman mentioned above could not have been prevented. Her diagnosis was extremely unlikely, especially considering headaches were “her usual.” Yet the doctor has been tormented for 25 years by feelings of responsibility and failure—that if somehow he’d only known, she’d be alive today. This doctor is an example of a “second victim”—a term that historically has referred to a patient’s family and friends who experience deep and lasting grief, and now increasingly also refers to physicians, nurses, and other healthcare professionals who are devastated when someone they have been caring for dies. Studies have found that second victims’ symptoms are strongly similar to those of post-traumatic stress disorder, which include unavoidable memories of trauma, nightmares, difficulty concentrating, self-doubt, and even suicidal thoughts. Although we don’t know with certainty how many doctors have these symptoms or for how long, we do know that a high number of them consider career changes after particularly traumatic events—and that doctors kill themselves at an estimated rate of at least twice that of the average American. 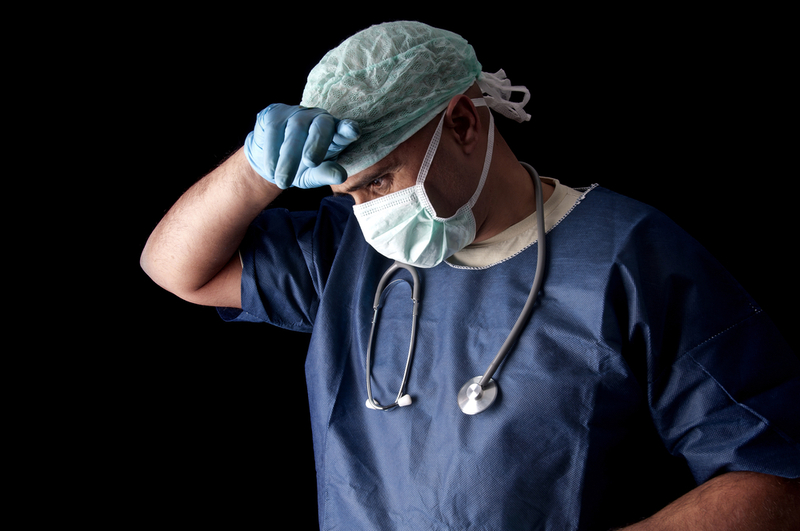 Physicians cannot crumble any time they are faced with a tough situation. But research is starting to show that specific types of cases may be indelibly traumatic. This doctor has a point; physicians cannot crumble any time they are faced with a tough situation. But research is starting to show that specific types of cases may be indelibly traumatic. Some of the factors in these cases that seem to correlate most highly with severe second-victim symptoms are unsurprising, like death and gruesome injuries. But there are other factors, too, like if the patient was a child, pregnant, or a victim of crime, and the extent to which a bad outcome was expected or could have been prevented. As well, there is a very powerful and personal sense of responsibility, maybe coupled with a feeling of having failed at one’s life work, when something tragic happens to a patient. Ignoring this problem may be jeopardizing not only doctors’ well-being, but their patients’, too. After the loss of a patient, as one physician wrote me, “it is not uncommon in medicine for doctors and nurses to be asked to immediately move on to new patient care, without time to regroup, without time to grieve with the patient’s family, without time to debrief with other team members, and sometimes with barely enough time to complete the paperwork.” One study found that nearly 70 percent of doctors surveyed felt their ability to provide safe care was compromised by poor concentration and clouded judgment for at least a few hours after a catastrophic event; about 22 percent said this lasted a week or more. Yet only 7 percent received any time off. This is alarming. So far, studies haven’t been done that can definitively tell us patients actually are harmed by healthcare professionals who don’t get the right support after bad incidents. And we aren’t even entirely sure what the right support entails. But there has been more attention lately on the many factors that could diminish a physician’s ability. Newer regulations are in place to ensure doctors in training aren’t excessively fatigued (limiting work schedules to 80 hours per week) and that they are adequately supervised. Licensure and board certification standards are becoming more stringent, and now require periodic re-certification (compared to the earlier standard in which board certification was good for life). And, we are seeing increased concern about aging physicians who may be too old to be at their best. Given this, shouldn’t we worry about a physicians’ emotional and psychological well-being, too? True, it is a hard problem to address. It would cost hospitals money to relieve clinicians from duty and provide support services. Not all clinicians would want the same kind of support, and many would not recognize or admit if they needed it. But doctors are humans, just like the rest of us. We should want them to have feelings, empathy, and an invested connection with their patients. Not everyone shares the “soldier on” mentality. One doctor responded to our survey: “No death is easy, even when it is expected.” Given the choice between a physician who brushes off death and one who feels the pain of patients and their loved ones, I’ll always take the second option. And I hope our society will support that physician in grief, so they don’t work on patients when not at their best. My life—or yours—could depend on it. Marjorie Podraza Stiegler is an anesthesiologist at the University of North Carolina Chapel Hill, and the director of the Consortium for Patient Safety and Experiential Learning. Her website is marjoriestieglermd.com. *Photo courtesy of Luis Louro.